ASK Apparel store owner Alisha Summerville has poor broadband access at home, so to conduct online business she relies on her smartphone and her brick-and-mortar location in Heber Springs, Arkansas, Oct. 12, 2018. "Remember dial-up?" That's how Ashley Vaughan responds when she's asked to describe her internet speed at home. She's a resident of Pangburn, Arkansas, a town of about 600 people. After leaving the area for a few years, she returned in 2015. 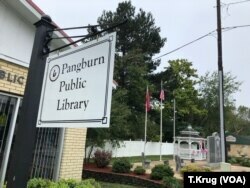 Many Americans still have poor broadband access, including the residents of Pangburn, Arkansas, which has a population of about 600 people. The town's public library is seen Oct. 14, 2018. In Vaughan's case, she says her internet speed is only 0.05 Mbps. She's called her internet provider to complain, but was told her service was the best available where she lives. That slow speed doesn't just mean fewer shows watched or video games played. It also impacts Vaughan's son's schoolwork, which increasingly requires use of a computer. Vaughan describes an instance in which her son took hours to download a single textbook, preventing anyone else in the house from using the internet during that time. "Fiber lines are expensive to install, and older copper lines are expensive to maintain," said Jameson Zimmer, a broadband analyst with BroadbandNow, a data aggregation company based in Los Angeles. "What to do about this is overwhelming," Zimmer said. It's a problem that both Republican and Democratic party leaders are working to solve. In an email to Voice of America, Boozman wrote that investing in affordable, high-speed internet would strengthen the American economy. He applauded President Donald Trump for signing an executive order earlier this year to expand broadband access into rural areas but said the issue needs attention from "all levels of government." "There is a sense of urgency in the need to close the rural broadband gap. Today, reliable connectivity is just as essential as traditional infrastructure like roads and bridges," Boozman wrote. "I've seen students sitting in the back of pickup trucks outside of schools in order to access the internet to complete their homework." Alisha Summerville feels that urgency. She's a co-owner of the online store ASK Apparel, which launched last year and is based in Pangburn. Even though she relies on her smartphone to do most of her work, the store earns $10,000 to $15,000 a month from online purchases and sells to customers in 18 states. 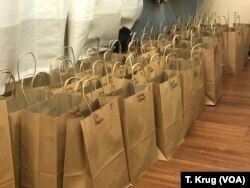 A week's worth of online orders are ready for pickup at ASK Apparel's Arkansas brick-and-mortar store in Heber Springs, Oct. 12, 2018. "That's where business is going," Summerville said of internet sales. "When your internet is down, so is your business," Summerville said. "When I'm thinking about internet, and I'm thinking about sales, I'm thinking about how much further we could reach."